I will start by saying that I have an amazing relationship with my mother-in-law—she couldn’t be more loving, supportive and kind and I am thankful for her every single day. Having said that, there is something fascinating about the relationship between a woman and her mother-in-law. It starts when the women are mature people, set in their ways. The boundaries of the relationship are ill defined and nebulous, so easy to step over by accident or on purpose, bruising feelings irrevocably. I’ve been a fan of Sally Hepworth since I read her beautiful book, The Things We Keep, and with her newest release she has finally achieved that high bar again. This Mother-In-Law is a completely different book, more domestic suspense than women’s fiction, but equally enjoyable. I devoured it in two days, fiendishly turning the pages to figure out what happened to Diana, which or her family members was involved in her death and why. This is a book for anyone who loves a twisty turny suspense novel, who loves well developed characters and believable motivations. I loved every minute and I can’t wait for her next book. 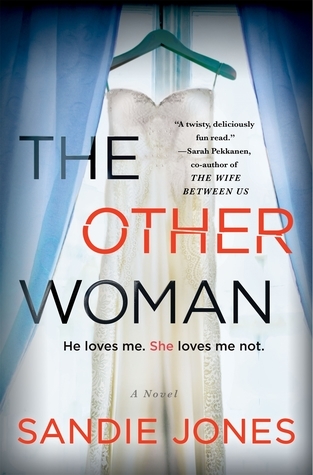 The Other Woman by Sandie Jones also features an evil mother-in-law character. When Emily meets Adam, she is sure she has met the man of her dreams, that the search is finally over—until she meets his mother. Pammie is dedicated to her son, her love for him bordering on obsession at times. The relationship between Emily and Pammie is strained at best and Emily begins to question whether Adam is worth it. This one also takes a satisfying U turn that left me impressed with the author’s skill and I turned the last page feeling satisfied with the conclusion.